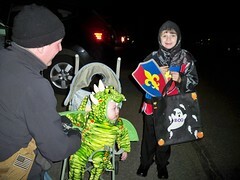 This was Riley's first Halloween - and he was a Dragon. Max and Riley when Trick-or-Treating in Estes Park, and they had a blast. There was tons of people and the downtown area was closed off. They were handing out candy by the handful, carmel apples, doughnut holes, popcorn balls, and hot chocolate. Amazing! Max said it was the best Halloween ever.